Does the Eco Egg contain harsh chemicals? No, none of the products in the range contain any harsh chemicals, petrochemicals, optomisers, bleaches or amonias that normal detergents often contain. How Long Will the Eco Egg Last? Approximately 720 washes, which is about 3 years worth of washing for the average family (based on 4 or 5 washes per week). Note: The number of washes that the Laundry Egg will last for depends on many factors including the hardness of your water, the load size and the length of the cycle. 720 washes is an approximation for guidance only. Is the Eco Egg Safe to Use with Sensitive Skin including Babies Skin? Yes absolutely, as there are no harsh chemicals involved. All our products have been assessed and approved by Allergy UK, the leading medical charity for sufferers of allergy, sensitivity and intolerance. 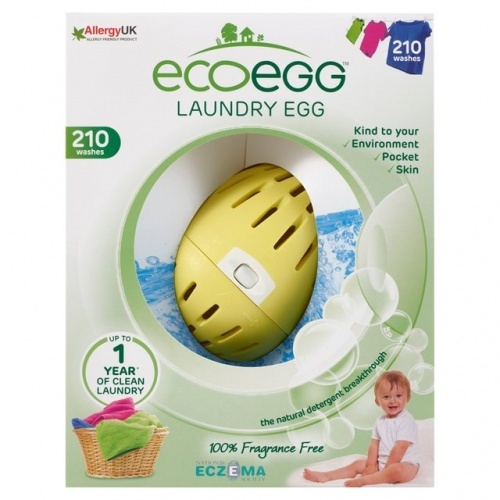 What’s more, the National Eczema Society are also happy to put their name to our Fragrance Free Laundry Egg. I absolutely love the EcoEgg Laundry Egg and was delighted to be able to easily order some refills for it. Added bonus, they arrived very promptly, thanks so much!! So good. Really happy with the light scent. A pleasure to deal with this company, good quality products and fast delivery. I find the eco egg to be a brilliant product! I've been using it for over a year and now I needed the refill so happy to keep using it. While very soiled toddler clothes might need a little extra help I won't go back to normal detergent usual washes.